Fig. 1. Crest of the Native American Church at the house of former peyotera and church matriarch Amada Cárdenas, 1999. 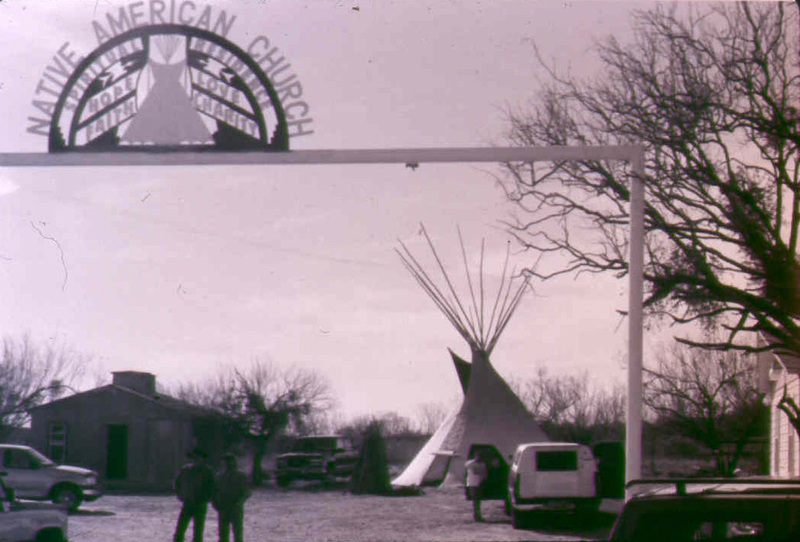 When Native American Church (NAC) members use peyote, it nearly always comes from lands in South Texas. Known to botanists as Lophophora williamsii, the cactus figures prominently in Native American Church ceremonies because it is credited with bringing the person who ingests it into closer contact with the sacred. Native American peyote “prophets” initially spread the peyote way from tribe to tribe in the late 1800s, planting the seed for a nascent Native American religion precisely when tribal ways of life were under assault. By incorporating the NAC in 1918, peyote religionists secured constitutional protections and status as a federally recognized religion. Peyote is permissible today for NAC worship, but remains a restricted Schedule One drug for non-church members. The availability of peyote has been imperiled in recent decades, however. Because peyote prefers the arid climes and rocky soils of lands by the Texas-Mexico border, Native Americans who seek it usually have to travel to the region themselves. There, they rely on licensed peyote dealers, peyoteros, to harvest and sell them the cactus. These peyoteros, identifying as Texas-Mexican Americans or Tejanos, are themselves closely tied to the land. Some of them hail from families that have been involved in the peyote trade since the mid-nineteenth century, and many have developed close ties with Native Americans over time. From the mid-twentieth century onwards, perhaps the best known of these peyoteros/as was Amada Cárdenas (1904–2005) of Mirando City, Texas. So closely was she identified with the “peyote gardens” that many NAC members journeyed from their distant reservations to visit her in her old age, even bringing their children to meet her in her home (Fig. 1), itself a former church headquarters. Fig. 2. 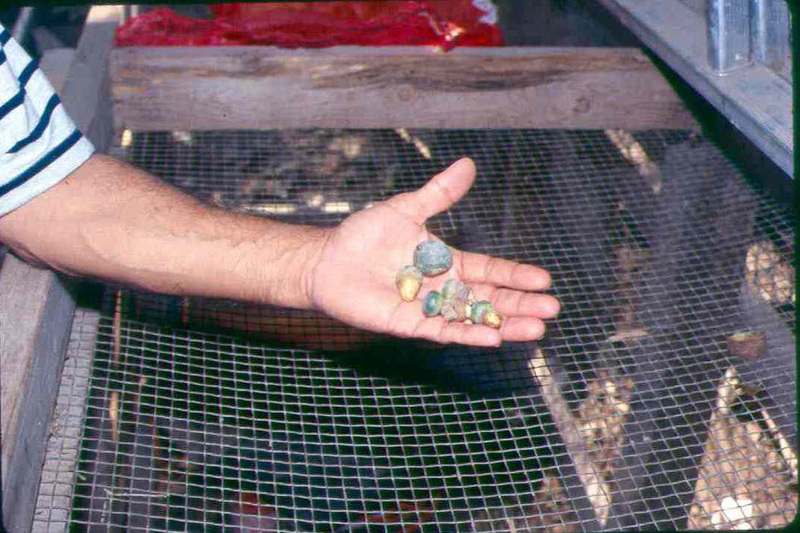 Tray of green peyote at a peyotero’s house in Rio Grande City, Texas, showing properly and improperly cut specimens. The circled specimen has been completely dug out of the ground and will not regenerate. I learned about the NAC and its peyote needs by visiting over a dozen church gatherings in Mirando City between 1997 and 2006. I spoke with many church officiants about their difficulties acquiring the “medicine,” as many Native Americans call peyote to underline its sublime healing qualities and spiritual potency. Over time, I formed friendships with different families and learned how peyote’s cost was affecting them; many invited me to their peyote ceremonies. I also interacted with four peyoteros and a landowner in Mirando City, Rio Grande City, and Roma. My learning about the NAC and peyote was thus conversation based, longitudinal, and participatory. The long-term availability of peyote worries nearly everybody, I quickly discovered. Many people are anxious about peyote’s increasing scarcity, something amply researched by George Morgan (1983, 1976) and Omer Stewart (Morgan and Stewart 1984; Stewart 1987), who discussed how destructive land practices have severely affected peyote populations. Morgan (1976) revealed how root plowing and cattle grazing have done the most direct damage, and how these intrusions hurt peyote recovery by altering local plant and water profiles. Irregular rainfall, high summer heat, and overharvesting have also threatened the cactus. Fig. 3. A peyotero holding immature peyote plants and buds that some buyers ask for. Peyoteros buy peyote from hired cutters who pay to enter ranches to harvest peyote. This payment, the cutters’ surcharge when he sells to the peyotero, the availability of peyote, and demand all affect peyote’s price. Peyoteros must account for these cost factors and still try to make a profit. The ever-increasing price of a sack of one thousand peyote buttons thus reflects peyote acquisition costs and what buyers are likely to pay. In 1998, when peyoteros were already noticing a decline in peyote growth, a sack cost $130. The cost grew steadily in subsequent years, reaching $180 at the northern end of the peyote range in 2000. By 2014, though, prices had climbed considerably, reaching $350 to $400 per sack, leaving buyers expecting still more price increases. Unflagging demand and scarcer plants have since pushed peyote’s cost to its highest ever level in 2018: $450 per sack. Unlike before, Native Americans can no longer pay to enter ranchers’ lands and harvest peyote themselves. This has stirred NAC interest in buying peyote-bearing land, and even in trying to propagate the cactus directly. Numerous church members have inquired into lands around Rio Grande City, Roma, Mirando City, and Hebbronville, and at least one NAC group has bought land in the historically peyote-rich acreage near the latter community. It is unclear, however, whether peyote grows on this land any longer. But whether NAC members acquire peyote from dealers or from purchased land, peyote’s sustainability will hinge on how it is actually harvested. Competent cutters cut the mature plant at the ground level, leaving the root intact and able to grow new crowns. Others, though, extract the whole plant or target immature buds (Fig. 2). 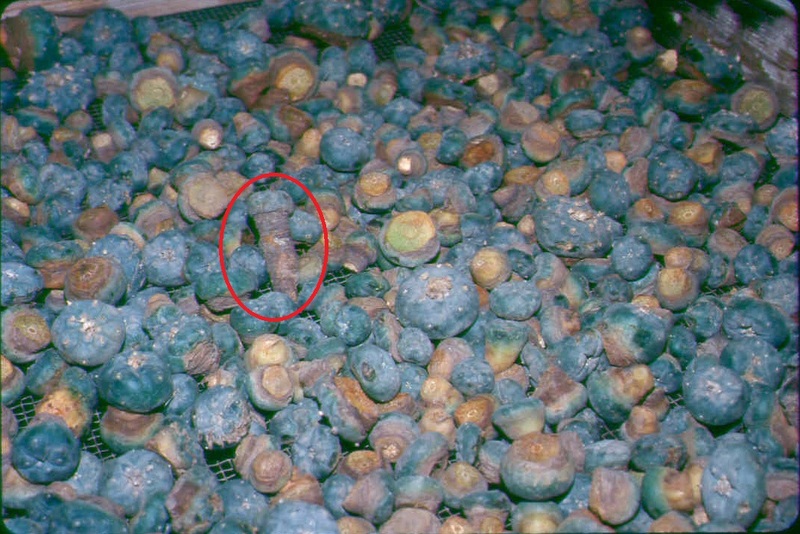 Peyoteros say that some NAC buyers even request small plants and buds, saying that these are juicy and do not have to be chopped (Fig. 3). Collecting young specimens, of course, impedes peyote’s regrowth. These practices remind us that better harvesting methods, land management, and cooperation among cutters, ranchers, peyoteros, and peyote consumers are needed to ensure the plant’s sustainability. Hinojosa, Servando Z. “Peyote Veneration in Challenging Times: Issues of Land and Access in South Texas.” Environment & Society Portal, Arcadia (Summer 2018), no. 19. Rachel Carson Center for Environment and Society. doi.org/10.5282/rcc/8389. Morgan, George R. “Hispano-Indian Trade of an Indian Ceremonial Plant, Peyote (Lophophora williamsii) on the Mustang Plains of Texas.” Journal of Ethnopharmacology 9 (1983): 319–321. Morgan, George R. “Man, Plant, and Religion: Peyote Trade on the Mustang Plains of Texas.” PhD diss., University of Colorado, 1976. Morgan, George R., and Omer C. Stewart. “Peyote Trade in South Texas.” Southwestern Historical Quarterly 87 (1984): 270–296. Schaefer, Stacy B. Amada’s Blessings from the Peyote Gardens of South Texas. Albuquerque: University of New Mexico Press, 2015. Olsson, Karen. “With the Peyoteros: The Fruits and Thorns of the South Texas Cactus Trade.” Texas Observer, 2 March 2001. Servando Z. Hinojosa is a professor of anthropology who researches Mexican-American peyote dealers, Mexican-American folk-medicine practitioners, and Kaqchikel Maya ritualists and healers. He holds degrees from the University of Texas at Austin, University of California, Los Angeles, and Tulane University. Servando has taught anthropology at the University of Texas Rio Grande Valley in Edinburg, formerly University of Texas-Pan American, since 1998.